Hey guys! I'm pretty excited for the posts I have planned for you the next couple weeks, because they're all something I haven't really blogged since before baby Lydia came. For instance, I haven't given away any jewelry in a long time, and what better way to break that sad streak then to join the rest of the online world in hosting a giveaway to give one lucky reader this glitzy and glamorous necklace from Amrita Singh(worth $120!! ), just in time for all those festive holiday parties! I fell in love with this necklace the instant I saw it, and since I know I'm not the only girl who'd rather get dolled up in other colors than the traditional red or gold for holiday parties, I thought that this sparkly piece would be perfect to give away right now, just in time to complete that outfit you've been forming in your head for that special night:) I love all the excuses for getting dressed up during the holidays, so lets get to it already! P.S. if you're interested in seeing the most recent photo updates on baby and family, click to follow below on IG! I have a great LBD this would be amazing with! I would pair it with a white collared shirt or a yellow dress. This is so cute! My fiance and I are going out for New Years with another couples friend to a live venue club. Champagne, live bands... This is just the fun piece I've been looking for to pair with my striped peplum dress! I would wear this with a nice dress I have. It is jersey on top and a pretty pleated plum color from the skirt area, with little flowers. I think this turquoise necklace would complement it well. I absolutely love this necklace! I have this striped sweater that I think would look really good with it! this necklace is absolutely gorgeous! thank you for giving us, your fans, a chance to win it! I so wish that I was more lucky! Then I might actually win this! So cute! I have a yellow sweater that would look soo good with this! Love this necklace! So many blogs are doing some sort of giveaway right now and I think it's so wonderful! Turquoise is such a versatile color than can go with so many things! Fingers crossed!! I think this necklace would look amazing with a white t-shirt, skinnies, and boots. Or a super cute little black dress. It looks gorgeous and versatile. I think I'd pair it with an oversized sweater, legging, matching nailpolish and my so cozy UGGS. I'm the maid of honour to my BFF's wedding on Jan 4th, and I'll wear the most gorgeous green dress. This will definitely come in handy and will give my outfit a bit of colour! But on Christmas Day I'll wear it with a LBD and sparkly gold shoes. Hope to win! It's fab!!! This is gorgeous! I would love to wear it out on my birthday and New Years.... the perfect amount of contrast and sparkle! I would love to have this to wear out as a perfect accent on my birthday and New Years Eve! Just enough sparkle, and an eye catching contrast color! I am pregnant right now and not feeling wonderful about my fashion so this necklace would help me spruce up some of my maternity clothes! I have a dress that this would go perfectly with for my work holiday party! I'm really loving pastels this winter, so I think I would pair it with a mint colored T and a pale pink maxi! wow, what wouldn't I wear this with. The standard LBD, or jeans and sweater casual, but also I would lobe to see this with Brown and maybe some of my neon yellow. I would pair it with black leggings, a LBD, and some black pumps! oh! this would look LOVELY with my favorite strapless black velvet dress! I'm going to NYC, I would wear it with everything this winter!! Totally wrong with a LBD.... but PERFECT to dress up a plain crew neck sweater with skinny jeans a boots! This necklace would look great with so many things! I have a purple dress that I'd love to wear it with. Emily, this necklace could very easily be worn across all seasons. This winter I would pair it with a LBD for Xmas. This spring I would pair it with a cute neutral cardigan and jeans. This summer I would wear it with a cute strapless top and white capris and this coming fall I would pair it will dark denim and a chunky sweater. So many options. It is such a great piece. Emily-This Christmas I would pair this with a LBD. This spring I would rock it with a layered cardigan . This summer I would wear it with a strapless top and white capris and then this fall I would wear it with dark denim and a chunky sweater. I hope I win! So pretty! Red skinny jeans and a white blazer for sure! I would pair the necklace with a crisp, collared white button down shirt worn with dark skinny jeans and a navy clutch. My sister would say I'm crazy but I'd wear this with a white shirt and red hot skinny pants! I have a gorgeous black dress with white stripes on its skirt that would look fabulous with this necklace! This is my favorite color! I love that you found a necklace that is festive enough for the holidays but still a color that is perfect all year round! That is my favorite color! 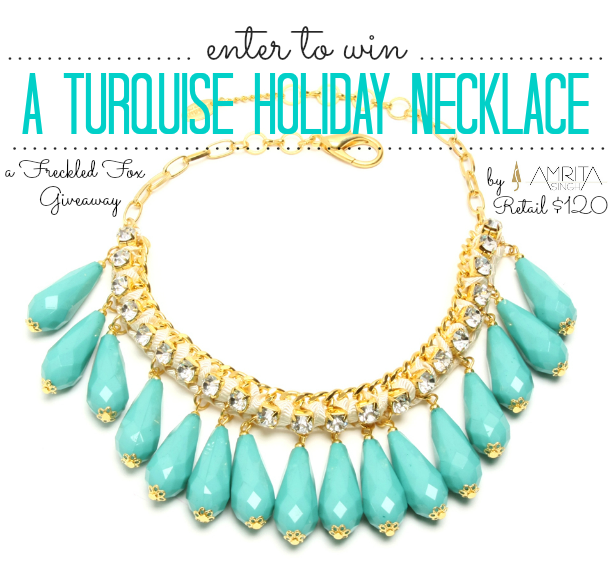 I love that you chose a necklace that's festive enough for the holidays but perfect all year round! This is such a gorgeous necklace! Would love to make this a statement piece and focus of an outfit with a LBD and heels! I would love to wear this with a LBD and heels and make it the center focus of the outfit! Would be so cute with a little black dress or a classic white collared shirt! I'd pair it with browns of some kind! I'd pair it with other turquoise and browns! I'd wear this necklace out on date night with my husband! I would wear this with my purple silk Christmas dress. The turquoise would look gorgeous with purple! I'd wear with with my turquoise cardigan, and a pair of jeans. I would wear this on a much needed hot date with my DH to a fine dining establishment and pair it with a great big SMILE! I'd wear this out with my sister and Mom who are coming to visit me in January after I have our second baby! im gonna wear it on new years with a sparkly lbd! !